Grief, anger, denial, frustration – There are many emotions that go into a character who has fallen from grace. These are the men and women who have done something bad, when they’re not supposed to be bad. These can also be the people who have lost their way, forgetting their purpose. These are the sad, heart-wrenching characters who help you invest in a story. We’re all human, we all occasionally forget what we’re fighting for – And this is how I’d portray them in writing. 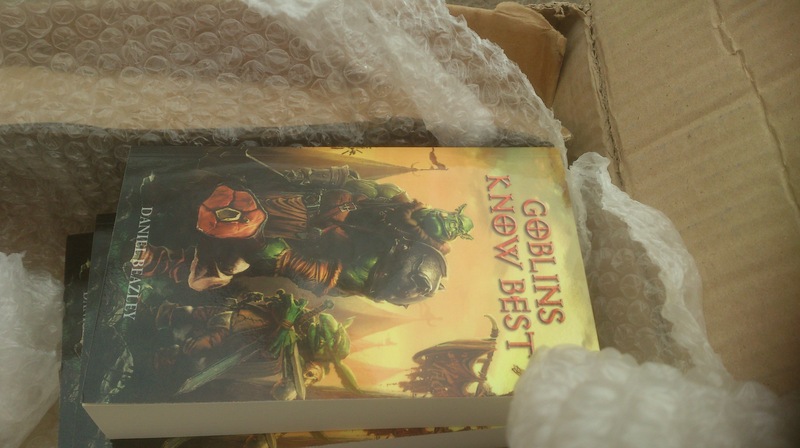 When I found out about the Eventide kickstarter campaign, a wonderful sci-fi/fantasy writer from the south-west of England called Daniel Beazley had put together, I also found out about his fantasy novel, Goblins Know Best. But of course, I couldn’t get behind the Eventide campaign without knowing a little bit more about the works of Daniel. So I reached out to him and lo and behold, I received a box as he sent me a review copy of this awesome comedy fantasy! Since reviewing literature is relatively new to me (I normally interview people, but we’ve already interviewed Daniel on here), rather than doing another interview with him, we’re going to review the novel. I thought I’d break this down into several sections, starting of with a bit of information on Daniel himself, then going straight into the review. This is the debut novel of Daniel Beazley, the award winner of the Fantasy Faction Anthology of 2012. He was born and raised in the South-West of England (sound familiar to our regular readers?) Since his debut, Daniel has gone ahead and made a Kickstarter to produce audiobooks for his existing Sepherene Chronicles series of books. In a short space of time, he’s found his footing as an author and has even dabbled with other ways to get his stories out there. his love for writing followed him when he went and joined the army, as well as when he went to work for the police. He begun writing in 1996 and says that some of his biggest influences include Tolkien, Feist, Gemmell, Lewis, Livingstone and Dever. 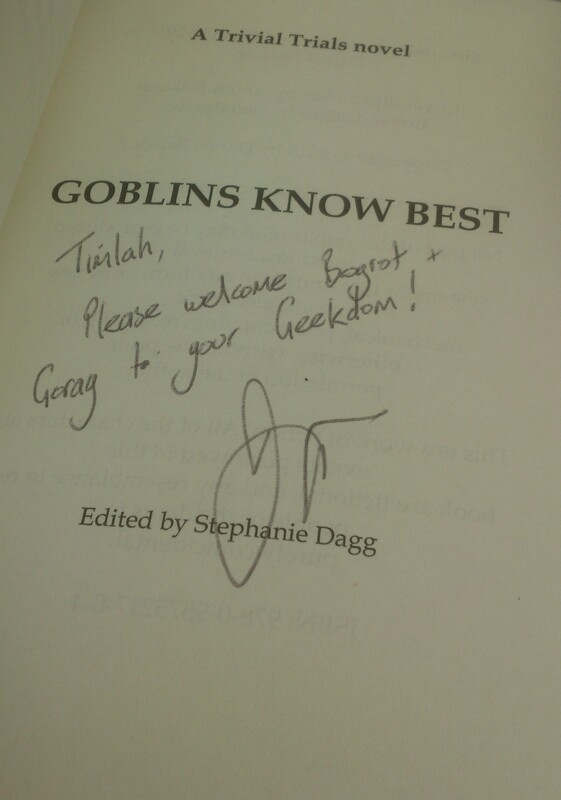 You can pick up a copy of Goblins Know Best for the Kindle at £2.40. Goblins Know Best is a humorous fantasy novel set in a traditional fantasy setting, where goblins, orcs, trolls and gnomes roam the world along with humans. The cast ranges from greenskins that inhabit the lands, such as Bogrot Blistertooth and Gorag Bather (the books protagonists), to humans such as the kindly adoptive mother, Gert. The unlikely duo of Bogrot and Gorag set forth, meeting some strange characters and constantly finding themselves doing odd tasks in their misadventures. The book is satirical in tone, giving the reader some little parts of flavour text to go along with it. As such, both Joel and myself came to the same conclusion that the writers style was a lot like Pratchett’s, but not quite as heavy to read. Whilst we’re both huge fans of Pratchett, we’re aware that he is a heavy read for some people. Thankfully, that’s where Daniel shines as a writer. He’s able to describe things not only in a humorous way, but in a way that you understand the logic of the world he’s painting. He’s able to do so with an easy to read narrative and that’s all thanks to the awesome characters he’s dreamt up. Okay Daniel, we’ll accept Bogrot and Gorag into geekdom. The use of “extra” bits of information. Use of Bogrot’s voice as a narrator. The novel left me from start to finish a really interested and engaged reader. During the whole book, I never felt like there was a dull moment where I wanted to put it down. It was a proper fantasy collection of stories of Bogrot and Gorag’s (mis-)adventures. “Extra bits of information” – I compared Daniels writing to a “lot like Pratchetts”. That might be because Daniel (or perhaps Bogrot) is very generous with giving you the extra details in sections you can gloss over if you want. They come in the form of parentheses next to the subject in question. Whilst Pratchett practices footnotes at the bottom of his pages, Daniel just inserts the extra information he wants to give you next to the piece he wants to expand upon. They explain more about the world that, quite frankly, is very different to our own. It allows you to fully appreciate why things are they way they are. “Bogrot’s voice as a narrator” – One of the biggest themes you get throughout the collection of stories are the constant use of Bogrot being your narrator. This gives you a different perspective than “Bogrot said”. Instead you’re left with a really clever mechanic, allowing you to feel as if you’re part of the action with Bogrot. You also get to understand the somewhat cynical views of Bogrot and exactly what he thinks of those around him. It’s a great way to build the character, who comes across as bright but ultimately weary. He knows how the world works, even if he is an odd little chef. “Great sense of humour” – This part should be self explanatory, but I will break this down by the introduction of a character. Bogrot is made aware that his buddy, Gorag, is in grave danger. As Bogrot sets off to go and help his friend, he buys two horses… One just so he could chop it up and put it in a nice stew and the other to actually ride to the trouble. On his journey, Bogrot finds himself talking to the remaining horse, who happens to be a talking horse! This horse doesn’t have a very good perspective on her circumstances and she is aptly named Mona Lott. It’s a simple introduction to a relatively simple character, but the banter between Mona and Bogrot is simply enthralling and believable… Which is why it makes for such good comedy. You believe the world you’re reading, so the predicament that Mona is in helps you understand the character and enjoy how she’s presented. Even if she’s just a horse! 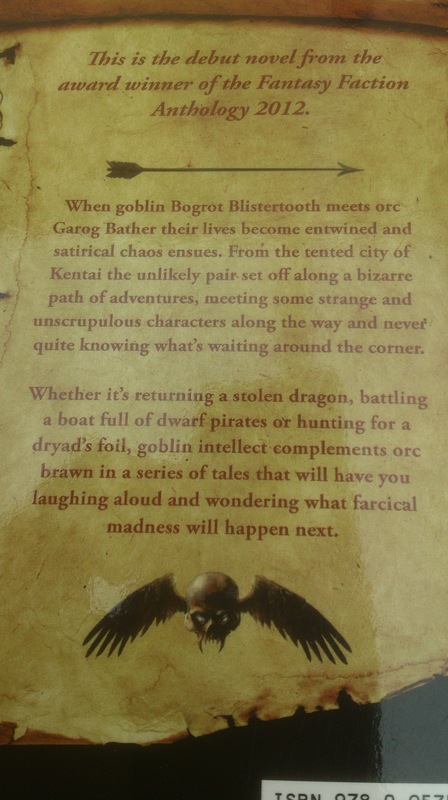 Front matter (first page) and the back of the book have a typing error on Gorag’s name (Calling him Garog). Young writing voice (Let me explain that one). Okay, so I’ve spoken about how good the book is and I’m very happy to point out that this guy, if he kept this style up, could be the next Pratchett. It’s a strong statement to make, but I honestly believe that his writing reads as friendly and as humorous as Pratchett, but it doesn’t have the the same heaviness of Pratchett novels. As such, this means his works would be quite easy to share with friends who aren’t necessarily literature fans. “Garog, not Gorag” – The only criticism I truly have is with the back page and the very first page, the front matter, it appears that whoever had written this has put Gorag as “Garog“. Now, this doesn’t detract from the story at all, because the story itself doesn’t have this mistake anywhere, but it seemed strange this small error was on the first page of the front matter and the back page. Normally, a mistake would just be on one page, but as I say, this appears in two locations. It’s a simple oversight which doesn’t happen in the book. “Young writing voice” – Other than this then, perhaps the writing style is a bit too simple for some people. Now, from my point of view: I loved it. I can imagine most of the people I know would love the heck out of this novel as it’s a proper fantasy novel filled with some amazing characters and proper fantasy creatures. However, for the serious fantasy fanatic, you’re not getting an epic fantasy. You’re getting a funny, silly little story about how Bogrot met Gorag… And how their lives changed through being around one another. Honestly, if you’re looking for a serious story, this isn’t it. If you’re looking for a fun, easy to pick up story, this is it. The point of the young writing voice really isn’t much of a criticism at all. In fact if used correctly, this could be a major selling point of his. I know I was reading around reviews of the novel and other people were under the impression that the writing voice of the book was rather young. It could just be that was how Daniel intended it to be and as I say, it left me satisfied. It left me enjoying the world more than if it were more serious. A box with several copies of the book? Overall, I’m very happy with the novel. It’s left some truly wildly imaginable characters in my mind and honestly, some of them I would love to see revisited in future novels. 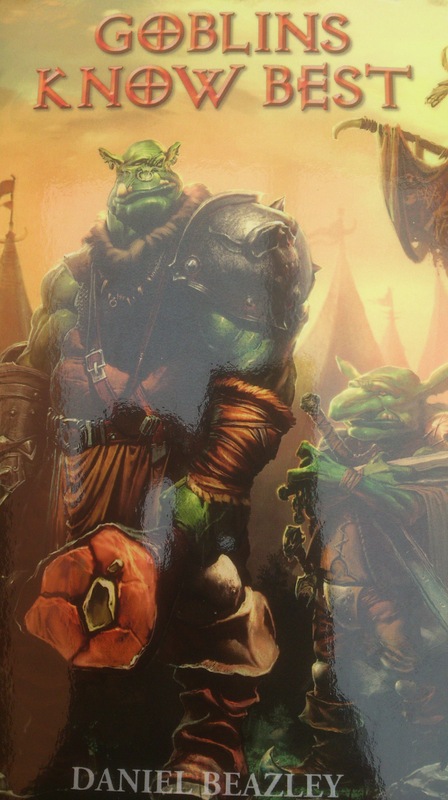 I noticed this was book 1 in a series called Trivial Trials, so hopefully we’ll be getting some more Bogrot and Gorag in our lives. Everything that was in this story left me hungry for more, which is more than can be said about a lot of books. I managed to consume the whole book in a matter of days, because I was enjoying the story so much. Whether it was the infectious style of having Bogrot tell us what’s happening from his perspective, or if Daniel is just a word wizard, I will certainly be coming back for more. Now it’s your chance for some fun. All you have to do is like the Facebook page and give us a comment on the post entitled –COMPETITION– – A duo of names befitting a Goblin and an Orc. You’re not allowed to use the names Bogrot Blistertooth and Gorag Bather. Well known Goblin and Orc names are welcomed, but Joel and I will be judging who has come up with the best Goblin and Orc names, as well as how well the two fit together. What do you all think of Goblins Know Best? I’m glad to have read this novel from an exciting new author. It’s been a journey (somewhat literally, with how the book reads) but it’s been one I’d gladly take again. As always, comments below, over on Facebook or Twitter and let me know what you thought about this review. Has this made you want to read it for yourself? What do you think of the price point (£2.40 on Kindle, £6.99 paperback)? Welcome readers to another issue where we celebrate the works of writers. 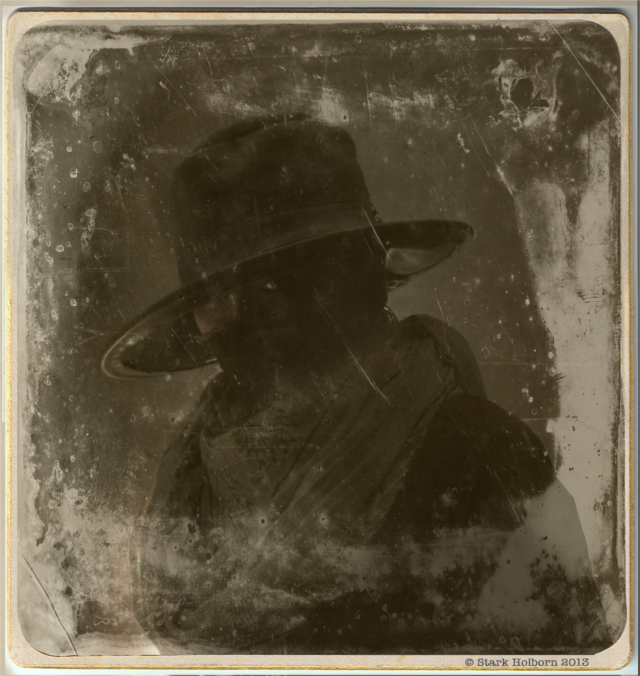 This week, I’ve had the chance to have an interview with the awesome Stark Holborn, who is close to releasing more books in his or her series Nunslinger. If you want to meet Stark, he or she will be attending this years BristolCon! If you’ve not yet got your tickets, please do remember to do so! A few of us in the GeekOut crew will be attending, so do stop by and say hi. I’ll… probably have knocked up another costume or something for the event. It is me, after all. So, read on and read about what the awesome Nunslinger series is all about and even learn a bit about the writer in the process. Q: Welcome to GeekOut South-West! As is customary, could you introduce yourself for our readers? A: Stark here. Small time liquor bootlegger, moonshine brewer, purveyor of Penny Westerns and author of the Nunslinger series. Currently hanging my hat in Bristol, UK. I tell you what, I’d rather see this style of avatar than the “games industry” ones flooding Twitter. You know the ones I mean. Q: So, you’re working on a series of books called Nunslinger. Before we go into the series, how did you get into writing? A: I reckon reading is what did it: my parents read to me and my sister every night for years. Not just children’s books either. Pa started reading us The Lord of the Rings when I was 2 and my sister was 4. Took him nearly 3 years to read us the whole thing. I still remember hearing the end for the first time. My parents read us all sorts, basically whatever they were reading at the time, from William S. Burroughs to Brian Aldiss. Anyhow, that showed me that stories came in all shapes and sizes, and got me used to always having a book in my hand. From then, I guess it was natural to want to try writing them, too. Q: I’ve read the first Nunslinger book which is awesome and really well priced on the Waterstones website. Can you tell me a little bit more about Nunslinger and how you began writing it? A: Nunslinger follows Sister Thomas Josephine, a nun of the Visitandine order, who leaves her home in St. Louis, Missouri, to set out on the perilous journey west, in order to join a mission in Sacramento, California. It’s 1864, the heart of the Civil War, and the road is bristling with dangers. Of course, her journey is far from smooth, and before she knows it, she’s a wanted fugitive. Add in a mysterious drifter, a dangerously obsessed Cavalry Lieutenant, shoot outs, jailbreaks, snow storms in the Sierra Nevadas, deserts, bandits and steamships and you’ll be on the right track. I began writing it… Well, to be honest I was sitting one Sunday morning, nursing a hangover and watching an old Western on TV. It was particularly bad one, featuring a nun who – when confronted by an objectionable grizzled ol’ cowchaser – seemed to forget every vow she’d ever taken in order to fall in love with him. “Jeez,” I thought, “that nun isn’t sticking to her guns at all.” (Sorry). So I decided to write one who would. Seriously worth the read, jump to it! Q: I’ve noticed you’ve written a number of books in the Nunslinger series. How many more books are there and are there more books for this series? When are the next books due? A: Nunslinger is a twelve-part series. The first nine e-books have been published in three-monthly instalments throughout 2014, with the final three due on 11th September. The Complete Series paperback is due for release on 4th December 2014. Q: Who are your inspirations as a writer? Are there any common themes in their writing or do you like them all for completely different reasons? A: You know, when I was 12 or 13 I was all about Tamora Pierce; she always had brilliant female lead characters and I wouldn’t be surprised if some of that influenced my approach to Sister Thomas Josephine – at least subconsciously. From a more modern angle, David Mitchell is definitely an inspiration: he makes me want to be a better writer (after I’ve finished sobbing “WHY DO I EVEN BOTHER I’LL NEVER BE THIS GOOD” into the corner). In terms of Nunslinger, I’ve taken inspiration and research from Patrick deWitt’s The Sister’s Brothers, which I think has helped nudge Westerns into people’s attention once again, to Elmore Leonard, Mark Twain, Walt Whitman, Mary Hunter Austin and even 14th century mystic Julian of Norwich. So a bit of a mixed tub. Q: What sort of research went into writing Nunslinger? How did you start the research and how do you keep track of it all? A: Apart from the writers mentioned above, the quick answer is A TON. The American Civil war is a particularly well-documented time, which has its upsides and downsides. 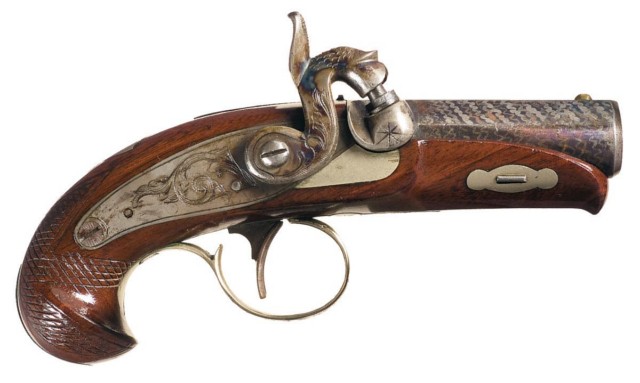 On the one hand, if you want to know what a fully functioning Philadelphia Derringer from 1859 looked and sounded like, there’s probably someone online who knows, and has posted pictures of it. On the other hand, it means that getting things wrong is pretty inexcusable. But there are some incredible resources out there, from internet archives to podcasts like Backstory, which help present a nuanced view of historical sources. I keep track of everything using Evernote, and tend to research as I go. It certainly results in some weird Google searches, like: “which desert lizards are edible?”, “how to skin an iguana”, “history of mattresses” and “recipes for groundhog”. I also watched a man cauterize a wound in his own arm with gunpowder. He didn’t look very well afterwards but he put the video up on Youtube anyway. A Philadelphia Derringer. I admit – Before this interview, I hadn’t seen one of these before! Q: You seem to be quite active in producing eBooks. Do you think eBooks are a good thing for writers, or should people be actively promoting physical purchases of books still? What’s best; digital or printed books? A: I wouldn’t want to champion one over the other exclusively, but my heart, like those of many other readers, will always belong to print books. However: ebooks and digital works do have the ability to do things that print books simply can’t. My pa had a stroke, for instance, and isn’t physically able to hold print books open or follow the text from page to page. Not a problem with a Kindle. But rather than just shifting texts from print to ebook format and leaving it at that, I think it’s important to look at the differences between the two, and the potential of digital to explore not just what we read, but how we read and address that. That way, it’s about different experiences rather than competition. Q: If anyone wants to keep up to date with your works, how can they get a hold of you or see any updates? A: Y’all can always reach me on Twitter (@starkholborn) and that’s where most updates appear. But other than that, there’s my website, where most of the important things feature, but without tweet-based ramblings. 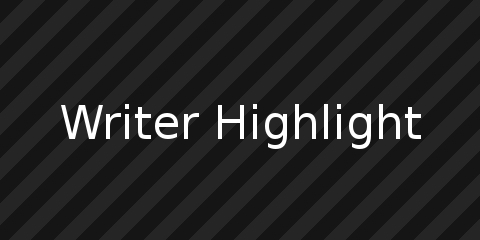 There’s also Hodderscape for other SFF news, pictures of dodos and general taxidermy. Q: Here on GeekOut South-West, we celebrate all things geeky. So what geeky hobbies do you divulge in? A: I ain’t had much time for hobbies of late, apart from drinking bourbon and writing, but y’all can’t go wrong with watching and re-watching Firefly. Except that isn’t geeky, that’s MANDATORY. Recently, I’ve become partial to a board game or two of an evening, mostly Dominion, because I’m the sheriff in that town right now. But first and foremost, reading. Always reading, and usually until far too late at night. I’ve just chomped my way through fantasy-western The Incorruptibles by John Hornor Jacobs and can definitely recommend it, it’s like Cormac McCarthy meets The Hobbit with a steamship and a bar brawl. I’d like to extend my thanks to Stark for his or her interview with us today (we still don’t know). The enthusiasm he or she brings for their work is a delight to read and honestly, it shines through in the Nunslinger series. You can buy all of the released Nunslinger books from Waterstones. Have you ever wanted to write a book but just didn’t know where to start? Just contact people who’re already releasing their works to the world, most of these authors are eager to share their experiences with people who are interested. Have you read any of the Nunslinger books before or ever heard of them? Let Stark know what you think of them, I’m sure he or she would love the conversation! Until next time, this has been another Writer Highlight. If you’re a writer who’d like a little bit of exposure, get in touch with us via the Contact Us page – We’d love to do an interview with you! Hi guys, thought I’d try something new here by writing a series of short stories once a month, probably normally would release them on the last Sunday of any given month. These stories will be between 1,000-2,000 words long and will all be set in the same world, although the characters and plots will change about. This first story is kind of like the prelude, so any feedback (“Good idea!” “Bad idea!” “You should go with x!” “You should stop this!”) is all welcome. Think there should be pictures? Let me know. If you think it’s no good and I should rethink this, just let me know. If the story seems somewhat interesting, again please let me know! You’re my audience, I’ll listen. Hey; why not suggest ways the story goes? I’ve got no real set plans for this – Just some short stories. It was 12pm, midday. At least, that’s what the little clock in the corner of the screen kept telling me. The time was always a few minutes out, but I was never that big of a stickler for the little details in the real world. In my world though, that was a whole different story. I never thought about what I was doing, about where I was going with this. I never thought about my motives, but I knew it had to be done for my sake and it had to be done now. No one else had ever achieved this, why? It seemed to make so much sense to me. An online role playing game where the characters are completely determined by the players, all customisation is done by them. They design, they make the artwork and standard animations are applied to their uploaded designs, based upon a simple algorithm that looks to see where the “spine” of the character is and works upon it. Sure, this game wasn’t graphically beautiful, but this was a first of its kind. It’s time to finish off the website now then to announce to the world that this new world is available and waiting for them. Little did they know, that I am a cruel dungeon master indeed. All of the enemies have been programmed, but they won’t be the players enemies to begin with, oh no, no. Whatever the players do, I will be watching and I will be in control of their stories. I will choose who the players enemies and friends are and I will determine which path they take until their characters untimely demises. No matter what they want from their characters lives, I will be the reason they get there or not. They had better play ball. … Let the games begin. You wish to know more about me? They call me the Vile Dungeon Master, the VDM. I got this reputation back during my time running a local Dungeons and Dragons campaign. Why was I vile? I wanted to be remembered. No, I needed to be remembered. I wanted them all to know that I am a man not to be trifled with. Actually, the truth is, I’m 21 years old next month. My name is Michael Vander Preston. I am fond of kittens and long strolls down the beach, with the sand beneath my feet. I enjoy the gentle caress of the sun and the soft breeze. Unfortunately, this never happens in merry old England. It is usually a grey, drab colour and the beaches are often covered in litter and debris. It’s a real shame, as other countries make them look so inviting. Some summers it is okay to go to the beach, however. What else can I say? The truth is I am a big softy at heart. I know I’m a big softy at heart, but this is my dilemma. I built a reputation for being The VDM. I am vicious and unrelenting to my subjects and it eventually lead to people not coming along to play my campaigns. Honestly, I just wanted to make people know me. I wanted our campaigns to be memorable, but alas, they were indeed memorable. Just for all of the wrong reasons. I am socially awkward and have stopped speaking to people. I’ve become a recluse and choose to sit with a book or my computer, rather than meet those who would share my interests. I know of my own shortcomings, sure. Am I dealing with my shortcomings head on? Sure I am! I made this world! I will be able to get involved with so many peoples’ lives! I can see love blossoming, friendships forming, allegiances strengthening. I can now be in control of all things. People will never need to speak to me directly. They’re speaking to me without knowing it. I’ve got my plans set out. I’ve made bots that deal with the majority of story-telling, but sometimes I can get more involved. I can take control of any enemy, any ally and any scene. I am omnipresent, I am god! And these people will love me. “Jason, you ready man?” My friend said loudly and proudly. “Yeah!” We were talking over a Voice-Over IP (VOIP) service called Piype. My friend, Adam, lived on the other side of town, so we would often talk on Piype rather than expect to go to each others homes. With gaming and communication as good as it was now-a-days, why should we have to gather on a sofa together? “Ping!” – My computer makes a small ping noise whenever a file is finished downloading. It was time to play this new game. The game was called “Computer Adventures and Dragons” which I found amusing. My character, I had already fleshed out. See, this game took the world by storm. Apparently, the Artificial Intelligence (AI) in this game was so advanced, it could detect even your next two moves! How impressive was that!? In rare instances, when you think you’ve done everything to outwit the game, rocks would fall and everyone would die. It was a saddening experience to lose your character in this game, as this was a game that you built your character up. You fleshed them out with your own backstory, you gave them your own custom graphics and animations are calculated for you. It was an incredibly advanced that was made for incredibly advanced players of games. This is why me and Adam wanted to play this game. We wanted to experience the full experience of gaming first hand. We wanted to feel like the story was being fleshed out by a real person, like this game supposedly does. We wanted to know what it was like to be outsmarted by an AI, which to us was a novel idea. The client was installed and I immediately halted Adam from starting the game up. “Wait, I’m going to check for what mods are available.” I said with a grin. I knew if we were going to go into a hard game, we would need player made mods. Adam agreed and we checked out the website for the game. We went onto the Computer Adventures and Dragons official website and found the section for player made mods. We were seriously disappointed at the lack of mods available, however we did realise this game had only been around for a month, so the community was still as new to this game as we were. “Finally!” Adam exclaimed, clearly exasperated at my slowness on the uptake. We finally pressed the great big “Play” button. Our adventure would finally begin. How little did we know, that this game was about to test our friendship in ways we had never thought possible. Comment in the comments by telling me if the initial concept behind these short stories will be easy enough to understand, whether or not I should seriously reconsider this, or if you have a great idea for a short story in this virtual world. Give me ideas, people! The power’s with you!